This is a comprehensive sale agreement based on a simple deal for cash and an option for the seller to take shares in the buyer company. There is provision for real property, but no option for an additional conditional payment if the acquisition meets targets. This is a straight forward purchase and sale agreement for a company in any business and of any size. The purchase price could be any amount. Some of this would comprise an equity stake in the buyer (or a company owned by the buyer), with the remainder being cash. The deal should be completed on the same day as payment is made. The company being acquired may own leasehold, freehold or tenanted property. 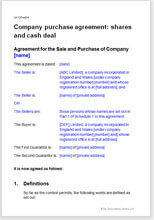 Despite being called a sale agreement, it is usually the buyer who draws up the first draft of the contract. This is because he or she is at risk from issues that only become known after the purchase. In order to reduce these risks, it is commonly accepted practice for the seller to give warranties that cover all aspects of the business. That means that the seller warrants that statements made during the due diligence process are true. If it subsequently turns out that the information was false, the buyer can seek appropriate reimbursement. If you are the buyer, there is advantage in choosing from the wide selection of warranties we include in this document. If you are the seller, likewise, there is advantage in being the party to present the first draft to the other, but rather because you can reduce the warranties you give. You will also receive an example disclosure letter in this pack. We have provided a format that gives an indication of how such a letter works and a style you could use. We also have documents to sell not a company but a business as a going concern. If you are not buying all of the shares in a company, you need a share sale agreement.